*AdvaCare Tiamulin Hydrogen Fumarate Feed Supplements are GMP certified. **AdvaCare Tiamulin Hydrogen Fumarate Feed Supplements are manufactured in our facilities located in China, India and USA. 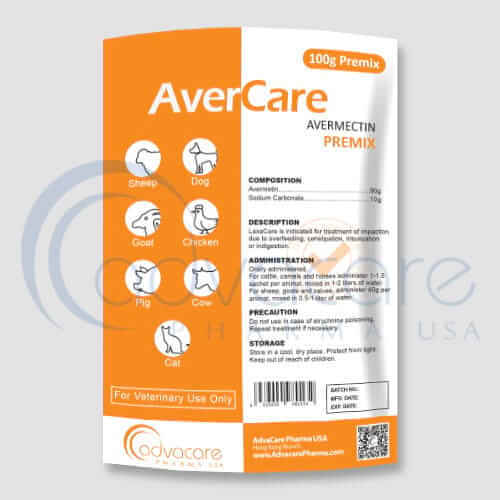 AdvaCare is a GMP manufacturer of Tiamulin Hydrogen Fumarate feed supplements. Tiamulin hydrogen fumarate is an antibiotic feed supplement which is effective against gram-positive and gram-negative organisms. In pigs it is used for the treatment and prevention of swine dysentery caused by Brachyspira hyodysenteriae, for the treatment of colitis caused by Brachyspira pilosicoli, for the treatment of ileitis caused by Lawsonia intracellularis and for the treatment of enzootic pneumonia caused by Mycoplasma hyopneumoniae. In chicken it is used for the treatment and prevention of chronic respiratory disease (CRD) and air sacculitis caused by Mycoplasma gallisepticum and Mycoplasma synoviae. In swine it is used in the treatment for dysentery, helps to control enzootic pneumonia. It reduces embryonic mortality, enhances egg production and hatchability for poultry, and is also used for the prevention and treatment of respiratory tract infections. 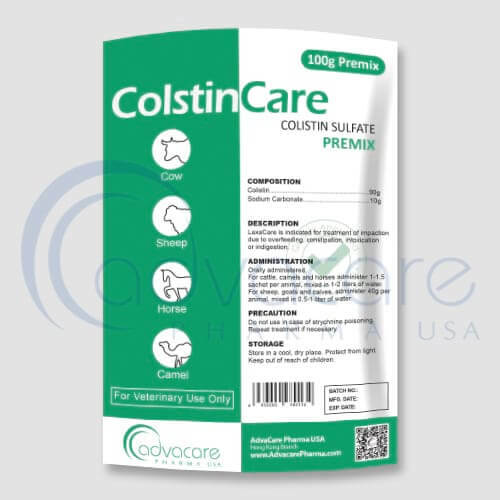 It contributes to the improvement of the health condition of the herd in cases of increased disease recurrences and lethality. As with all veterinary products some unwanted effects can. Always consult a veterinary physician or animal care specialist for medical advice before use. No side effects have been detected yet, if you notice any serious effects or other effects not mentioned on this package, please inform your veterinary surgeon. If any symptom persists or gets worse, or you notice any other symptom, then please seek veterinary medical treatment immediately. Always consult a veterinary physician or animal care specialist before using tiamulin hydrogen fumarate feed supplements. If the condition does not improve or becomes worse, then call a veterinary physician or animal care specialist. Tiamulin hydrogen fumarate feed supplements is not for human consumption. The product can be administered by mixing with drinking water or animal feed. Usual dosage include: 5-10mg/kg bodyweight for 7 to 10 days in pigs, 25mg/kg bodyweight in chickens for 3-5 days, 40mg/kg weight for 3-5 days and 3mg/kg bodyweight for 2-3 days in rabbits. Do not exceed advised dosage, and complete the full treatment, as stopping early can result in a recurrence or worsen the problem. Treated animals must not be slaughtered for consumption at least for 7 days after the latest treatment of swine dysentery. Overdosage of tiamulin hydrogen fumarate may lead to transitory salivation, vomiting and an apparent calming effect on the pig. In some rare cases, redness of the skin, primarily over the ham and underline, has been observed during medication. 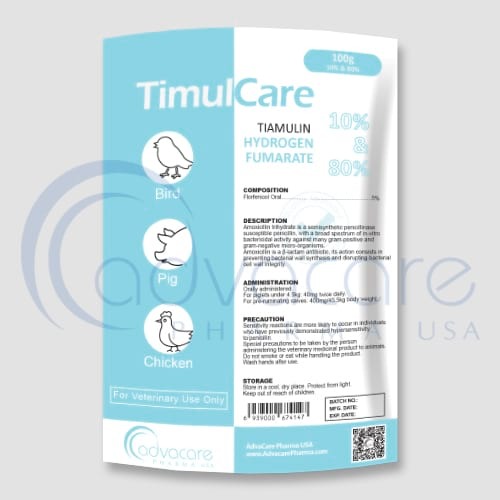 Consult with an animal care specialist about any other medications that are being taken by the animal, and their medical history, before their treatment with tiamulin hydrogen fumarate feed supplements. © 2019 AdvaCare Pharma®. All rights reserved.